Proof? You Can't Handle the Proof! 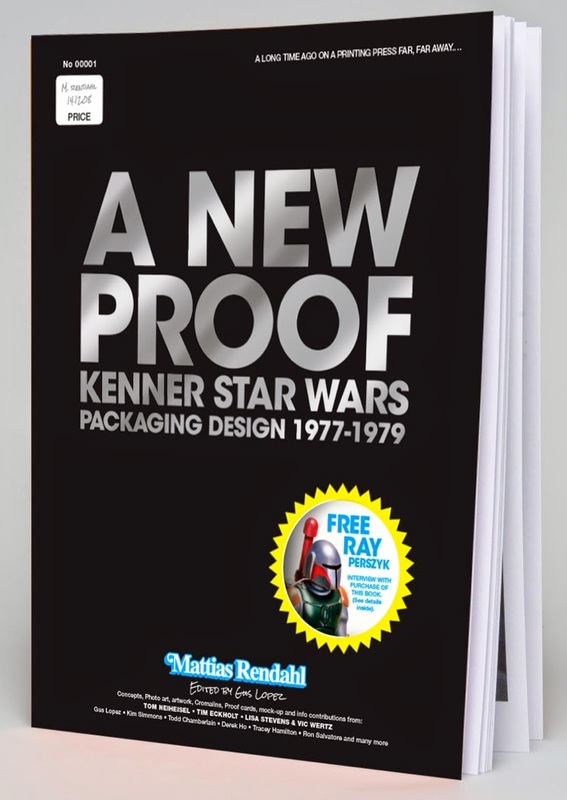 We're happy to announce that Swedish collector, designer, and all-around cool guy Mattias Rendahl has completed work on his new book, a stylish tome devoted to the process behind the creation of the packaging used on Kenner's first wave of Star Wars action figures. Judging by the sample pages Mattias sent me, it's going to be terrific. Mattias was kind enough to let me interview him about the publication. I hope the resulting piece will serve as a nice tease of the product as well as an instructive peak into Mattias' collecting and design philosophies. Ron Salvatore: So what’s the focus of this book? 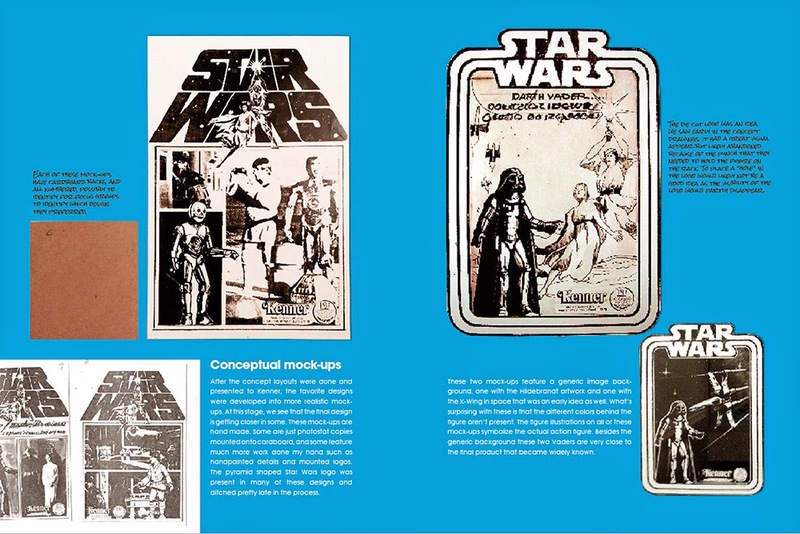 Mattias Rendahl: Kenner packaging design in the years 1977-79. Basically everything related to 2D pre-production, from concept to printed proof. It's the first book in a series of four. RS: It's a great topic. What to your mind makes proof cards and related material interesting collectibles? MR: As a designer I know how much importance the packaging has. 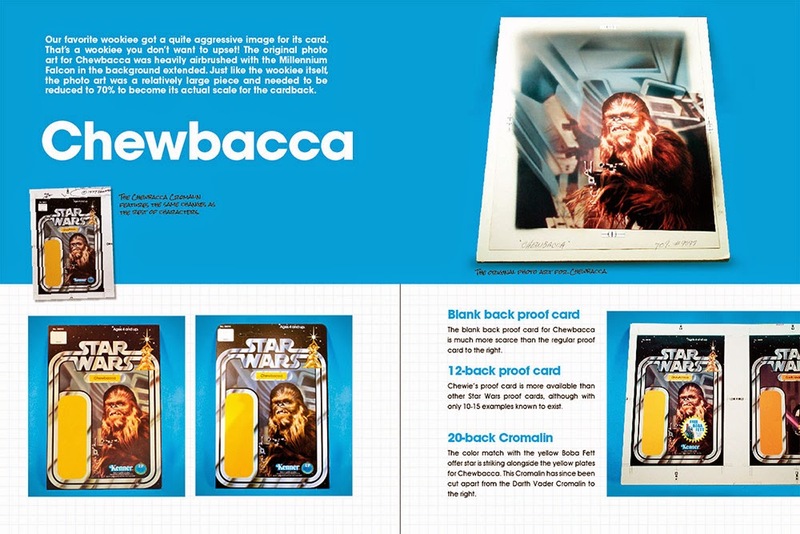 And just like the Star Wars movie itself, the packaging by Kenner was really something new. To me, proofs represent the best of two worlds, Star Wars and design (the latter is something I work with on a daily basis). But I have to admit that when I first bumped into proof cards and related things in the late '90s, I thought it was a stupid collecting area. As a designer I've marked hundreds of Cromalins, printed thousands of proofs, and then just thrown them away. I couldn’t see them as collectibles. They were more like a necessary evil that was needed to get to the final product. But that changed pretty quickly. RS: Proofs in particular have an interesting history as collectibles, don't they? Where do you think the hobby is today with respect to proof cards? MR: It has never been crazier. 2D pre production stuff always seemed to be much less popular than 3D prototypes, and historically there has always been lots of 2D stuff available through Tom Neheisel's sale lists, Steve Denny's sales, etc. So no one ever felt stressed about finding stuff. But as soon as the usual sources were sold out and the proofs disappeared into collections, the demand began to slowly increase. And with the growing popularity of pre-production material in general, proofs and such have become a huge collecting area among many collectors, partly because the stuff is out there for those who really want to pursue it. RS: How do you think the proof collecting hobby has changed in the last 15 years? MR: Proofs have gone from being easy to buy whenever you wanted for reasonable prices to hard to find and crazy valuable. One of the factors there is that most collectors seem to want to have at least one proof in their collections. And when you get one, you often want to get more. So the competition has increased a lot. 10 years ago it seemed like it was only Derek Ho that really cared about 2D stuff! RS: Aside from photos of cool things, what kind of content is included in the book? MR: Guides providing information on rarity and what's known to exist, info on the packaging design process, and some interviews. 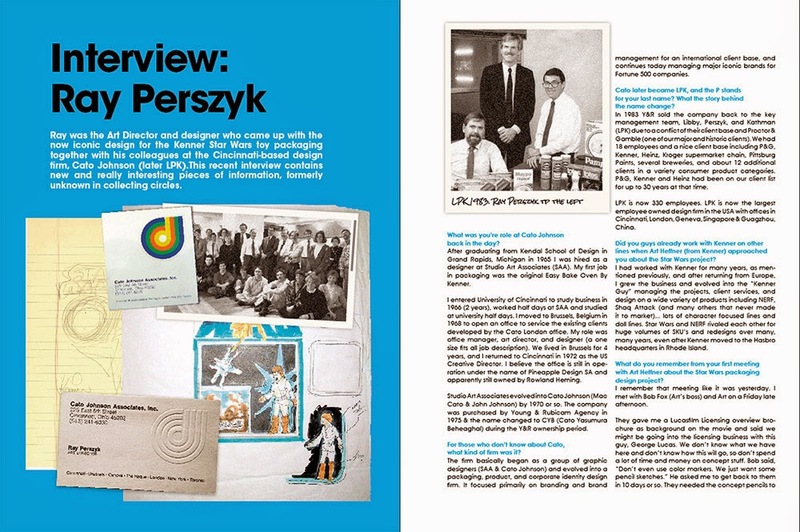 The interviews are with the original designer of the Star Wars blister cards and (former Kenner employee) Tom Neiheisel, who recounts his famous "rescue" story. RS: I see you interviewed Ray Perszyk, whose company had a hand in designing a lot of the early packaging and marketing materials. What was that like? MR: Surreal. Me being an art director like Ray, it was such an honor for me. I got to know him and talk with him about design from back in the day, and it was great that it was about Star Wars too. It was the best thing about this whole project. On one level I was just pleased talking with a guy who is the founder of a huge and successful design firm. I have a long way to go with my own advertising agency. RS: Did you learn anything interesting from him? RS: Definitely looking forward to reading more about that in the book. RS: It’s astonishing how much was saved from the blister-card design process. We’re quite lucky to be sitting here nearly 40 years later and looking at all of it. Do you have any thoughts on that? MR: It’s astonishing indeed. Lots of archives like this are thrown away, with just random stuff from nostalgic designers being saved. But the Star Wars hobby is unique in that so much pre-production stuff was saved. A lot of 3D stuff was saved by you guys (associated with the SWCA), and the 2D stuff was saved by basically two guys, Tom Neiheisel and Steve Denny. Without you guys I’d be collecting purple-smock variants for Ugnaught. RS: Hey, don't mock the smock! RS: We’ve seen a lot of self-published collecting books lately. What is the benefit of traditional publishing (i.e. books) over publishing on a website or blog? MR: Money. LOL. But seriously, there are two aspects. One is indeed money. When spending thousands of hours on a hobby, you're lucky if you can get some bucks back. And that's so much harder to do when you limit yourself to online publishing. But the main thing, which is far, far more important than any money (and most self-published books won't break even anyway), is getting a physical product. I love that: a real book is far better than a website, in my opinion. RS: Do you have any advice for collectors thinking of putting together their own books? MR: Make sure you have time. And money. And time! Plus, you need to be able to say when enough is enough, to know when to stop and just be pleased with what you have. It’s just like re-decorating a home: there are thousands of options but you just have to make decisions and live with some compromises. And if you aren't pleased with it in the end, you can always re-do it further down the road. And most important: do a book about a subject that you really love, not one you think others will love. That's how I approached this. Proofs are quite niche, and I’d be happy to just have my own example of this book. If others buy it that will be almost a bonus. RS: As a collector, what are some of your favorite books on collecting, and why are they your favorites? MR: From Concept to Screen to Collectible (by Steve Sansweet). Still the most in-depth book on collecting, and so well written -- a book that kicked off the hobby more than any other. Plus, John Kellerman’s action figure book, which really gave a boost to proof collecting and taught everyone so much about 2D stuff. And of course the books I've made with Gus (Lopez) and Duncan (Jenkins), especially the prototype book, from which I actually re-used some design elements for this new book. RS: I know you utilized collectors from around the world in acquiring imagery and information. Can you tell me a little about that? MR: That’s been a fantastic experience. So many people from all over the world have been so generous with sharing stuff and info. 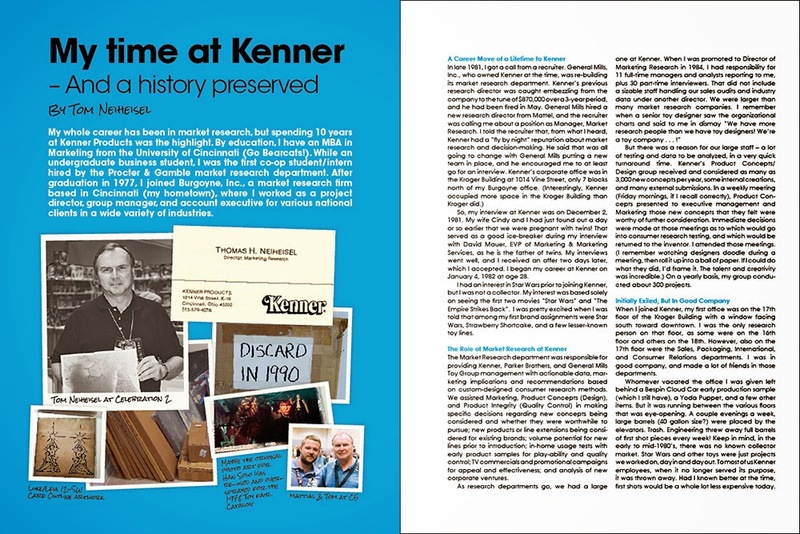 I wanted to put together a book that was as comprehensive as possible, and without reaching out to the community (and getting access to Tom Neiheisel’s photo archive), that would not have been possible. RS: It must have been difficult taking photos in different locales and under varying conditions. How did you manage that? MR: You were with me while I went through Vic's (Wertz) and Lisa's (Stevens) 2D collection. So you know it wasn’t very professional! Getting various pictures from all over was the real task. Most of the work was in trying to achieve the feeling that they were all photographed at the same time and in a studio. That took a lot of retouching work. And it's still easy to spot quality differences among the photos. Color quality varies as well. But that's kind of a good thing, as it’s next to impossible to use any of these images for reproduction. Also, many of them had to be retouched because they were in those d*mn AFA cases! RS: Hey, maybe someday someone will do a book on the design history of AFA cases, and collectors will praise the guys who saved those things. RS: You’re obviously a terrific graphic designer. What was your philosophy or strategy when designing the book? MR: Thanks! I wanted to make a book -- and this is what I always try to do -- that is fun to browse through, is historically relevant in its design, and is visually playful as opposed to static. RS: Who took that incredible photo of you holding the bootleg lightsaber? Is he a professional photographer? MR: It could have been you or Herb Ritts. I can't really remember and it's impossible to say for sure. But it was in Los Angeles. RS: Of all the items showcased in the book, which hold the most interest for you as a collector and researcher? MR: Ray's first design meeting notes and the conceptual hand-drawn sketches that were done later on. I've been after those sketches for ages, but they are of course next to impossible to find and/or pry out of collections. There are a few items in upstate New York that I’d love to get, but I doubt that collector would part from any of them. RS: Maybe the Herb Ritts estate will sell you something? RS: What to your mind made Kenner Star Wars packaging unique and noteworthy when compared to other toy packaging of that era? MR: Definitely the use of the color black. 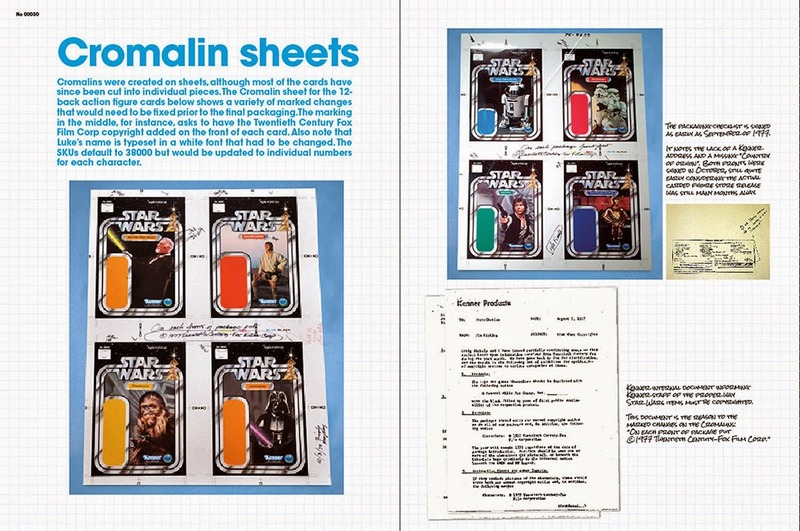 Before Star Wars, toy packaging only had blue, pink, or other bright colors. Black was a crazy idea. Today, black is normal when it comes to action figure packaging, but it was quite innovative back then. That and the cool design definitely contributed to the toy line's success. Even (Kenner chief) Bernie Loomis thought that, and he sent an awesome letter to the design firm thanking them for their role of the line's success. You can read that letter in the book. RS: Looking forward to it. RS: How do you think the vintage packaging designs compare to the designs for contemporary toy packaging? MR: The vintage featured such better craftsmanship. Today, everyone thinks they can do design and swing something together in Photoshop. But packaging design is a kind of art form -- one intended to help sales. And that is difficult to do. The thought and craftsmanship behind the vintage packaging; that's the main thing separating it from what you see today. You can see it took days to create some of that vintage stuff. And today that might be done in five minutes using Photoshop. RS: Having spent so much time immersed in this subject, I’m guessing you learned some things. What is the most interesting or surprising thing you learned while researching this stuff? MR: My father has been a printer his whole life. I've worked as a printer and in pre-press departments. Plus, I've been doing packaging design stuff myself. So it would have been hard for me to learn something new about the process. The new stuff I learned came out of the in-depth info I was able to unearth, info that I didn’t know existed. RS: What do you hope collectors take away from the book? MR: Knowledge about 2D pre-production stuff, its process, and its history. I hope people come away from it seeing proofs etc. as more than just cool, rare items that they "must have." Plus, the "wow, I had no idea that existed" feeling. RS: So how do people go about getting their hands on this? MR: Hopefully, I’ll start taking pre-orders at dearpublications.com soon. They won't be shipped until the week of Celebration Anaheim, where the first sale will be, but collectors will soon be able to reserve a copy. Since it’s a niche area, I’ve only printed a very limited number of books. So keep an eye out for the site to launch! RS: Will do. Thanks, Mattias. Be sure to join the Facebook Group for A New Proof for all the latest on the book. Fantastic article .... really interesting stuff. Can't wait to get a copy of the book. Sounds like you got your hands (or camera lens at least) on quite a few items. This book will be fantastic !! Thanks for the interview ... and thanks so much for putting this book together it will be a great addition to us collector's libraries !! I don't have a great interest in collecting pre-production items but this interview has really intrigued me. The pages above look fantastic and I'll certainly be ordering a copy. Fantastic job Mattias. I particularly like the way you've seemed to make the materials accessible to non-collectors of proofs. I don't own any of this so I'm happy to get such good reference. Plus, I'll be able to understand you folks on the 'Chive Cast better! "But packaging design is a kind of art form -- one intended to help sales. And that is difficult to do." I struggle through this daily at the office as we try and improve our own packaging. Packaging design is a weird blend of science and art, and these days far too many packages seem to go for flashy first and saleability second. I will be buying this book just as soon as it's available. I've produced some of my own books about toys -- and have new books in the works now https://www.kickstarter.com/projects/102137316/universe-expanded-kenners-1998-star-wars-action-fi -- and the amount of work that goes into making a great book cannot be dismissed or ignored. These sample pages look great and I will be happy to support this project just as soon as the book becomes available for purchase. Palitoy's Droid Factory: Base for Your Face! Toy Fair 2015: Get Ready for Revell!